Amyotrophic lateral sclerosis (ALS) is a rare disease that affects the motor neurons of the body. These cells make up the nerves that control movement of the voluntary, or skeletal, muscles. The cause of ALS is unknown in most cases, but it is known that some cases are hereditary, or run in families. People cannot catch ALS from each other. Amyotrophic lateral sclerosis (a-my-o-TROF-ik LAT-er-al skle-RO-sis) (ALS) is also called Lou Gehrig's disease after the famous baseball player who died after developing the condition. ALS is uncommon. In the United States, only one or two cases are diagnosed in every 100,000 people in a year. According to the Amyotrophic Lateral Sclerosis Association, about 30,000 Americans have ALS. ALS is rarely diagnosed in people younger than age 40. It occurs more often in men than in women. Fewer than 10 percent of cases run in families. The Pacific island Guam has been reported to have an unusually high number of people with ALS. ALS affects the motor neurons * of the body. Typically, it produces weakness and paralysis in the muscles it affects, and it causes these muscles to waste away. About 40 percent of people with ALS first notice clumsiness in their hands when they try to perform such routine tasks as buttoning a shirt. Others may become aware of weakness in their legs, or that their speech has become slower. As time goes on and ALS causes the muscles to waste away, the person's arms and legs become weaker. There may be muscle spasms, weight loss, and difficulty in breathing, eating, and swallowing. ALS does not affect the mind, however, and people with ALS are able to think as clearly as before. There is no loss of sensation, or sense of touch. British scientist Stephen Hawking has ALLS. ALS causes the muscles to waste away and may be accompanied by muscle spasm. weight loss, and difficulty in breathing eating, and swallowing. But ALS does not affect the mind, and people with ALS continue to think clearly. 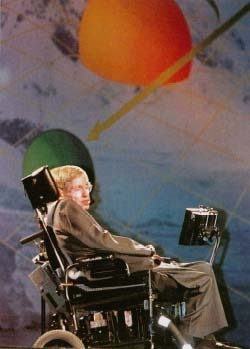 Hawking, whose specialty is theoretical physics, is know" as a visionary thinker; he has given many popular lectures on astronomy by using a computerized speech synthesizer. * neurons are nerve cells. Most neurons have extensions called dendrites through which they send and receive signals from other neurons. ALS was first described and given its name by the great French neurologist Jean-Martin Charcot (1825-1893). Charcot noted in detail the wasting of muscles (amyotrophy) and the hardening (sclerosis) of motor nerves along the sides (laterally) of the spinal cord. In France, ALS is known as "la maladie de Charcot," and in Great Britain it is called "motor neurone disease." Lou Gehrig, who played first base for the New York Yankees from 1923 to 1939, was one of the greatest players in the history of baseball. His lifetime batting average was. 340, and he hit. 361 in six World Series. He twice led the American League in home runs, and he tied for home runs with Babe Ruth once. Gehrig, whose nickname was the Iron Horse, also set a major league record in 1939 for playing 2,130 consecutive games. His career ended in that year, however, when he developed ALS. Because of his fame, attention was drawn to this condition. In the United States, it has commonly been referred to as Lou Gehrig's disease ever since. Lou Gehrig was elected to the Base-ball Hall of Fame in 1939. He showed his well-known winning spirit during the recognition day held in his honor at Yankee Stadium on July 4,1939, when he said: "Today I consider myself the luckiest man on the face of the earth.… I may have had a tough break, but I have an awful lot to live for." Amyotrophic Lateral Sclerosis Association, 27001 Agoura Road, Suite 150, Calabasas Hills, CA 91301-5104. The Amyotrophic Lateral Sclerosis Association website has information about ALS patients, families, caregivers, support groups, health care providers, and ongoing research.